Miles Morales (voiced by Shameik Moore) is an ordinary teenager starting a new school he’s eager to leave. His police officer father, Jefferson Davis (voiced by Brian Tyree Henry), is pushing him and can be embarrassing. His cooler uncle Aaron (voiced by Mahershala Ali) encourages Miles to express himself through his graffiti art. One night, Miles encounters the famous Spider-Man, a particle collider, and a special spider from another dimension that bites him. He develops super powers and seeks out Peter Parker (voiced by Jake Johnson) as the only other person who might understand what he’s experiencing. Except there happens to be multiple Spider-laden heroes, including Spider Gwen, a.k.a. 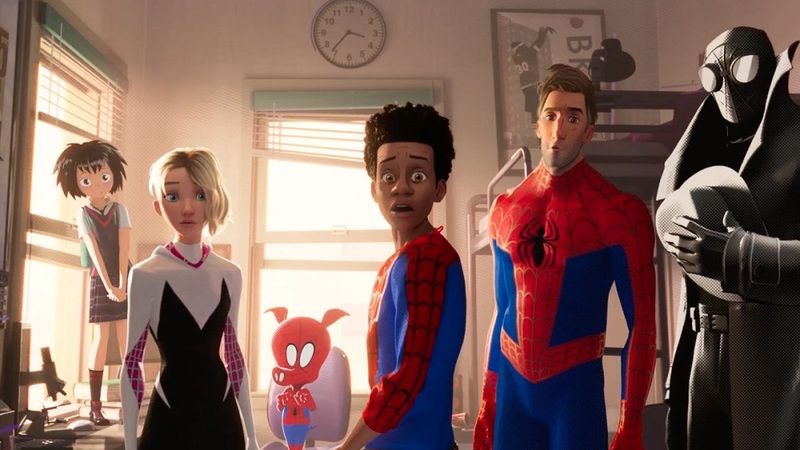 Gwen Stacy (voiced by Hailee Steinfeld), Spider-Pig (voiced by John Mulaney), Spider-Man Noir (voiced by Nicolas Cage), and an anime heroine Peni Parker (Kimiko Glenn) with a giant spider robot friend. They’re all from alternate dimensions, dragged into Miles’ world thanks to Kingpin’s (voiced by Liev Schreiber) particle collider. If they don’t get back to their original worlds, they’ll glitch out of existence, and Miles’ own world, and everyone inside it, is threatened by the instability of that collider. Into the Spider-Verse is bursting with color, imagination, kinetic energy, and a real celebration of the art form of animation and comics. Once that super spider bites Miles, the visual mechanics of the movie alter as well as him. Suddenly his thoughts are louder and appear in floating boxes (only we can see), in addition to thought bubbles, sound effects, and the occasional panel shifting transition device. It gets far closer than Ang Lee’s Hulk at recreating the experience of a living comic, and it’s joyous. The animation style too recreates the cross-shading effect of comic artists and the fluidity of the animation has purposely removed frames, giving it a slight stutter-step more often found in stop-motion animation. This distinct style might be off-putting to certain audience members accustomed to the smooth movements of modern animation mimicking real life, but for comic fans, it better approaches the captured stills of comic panels being connected into a whole. The different animation styles of the new Spider characters, Loony Tunes to anime to stark noir Frank Miller riffs, become reminders of separate universes with their own visual rules that keep things fun. The film is vibrantly colorful and gorgeous to watch on the big screen where a person can best luxuriate in that flamboyant palette. The finale feels like an explosion of splash pages and graphic designs merging together, even mimicking the sprawling graffiti art of Miles. It’s a spectacular visual feast that manages to be that rare treat of something new yet familiar. 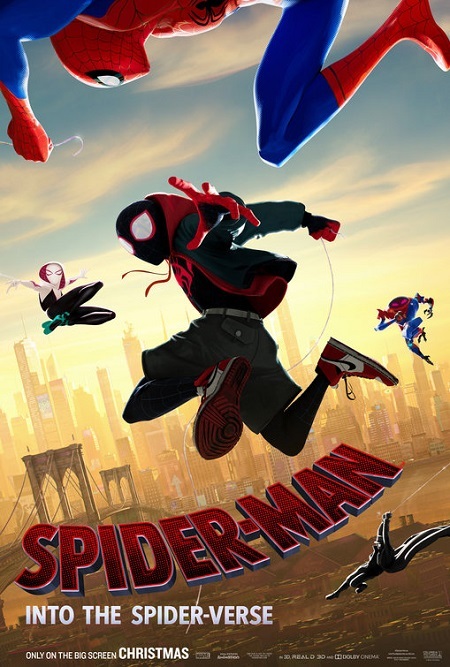 Besides being a great comic book movie and a great action movie, Into the Spider-Verse is also just a great movie. The Spider-Man character is so familiar that the film easily could have gone on autopilot, yet it puts in the work to build characters we care about, give them arcs, and provide setups and payoffs both big and small to maximize audience satisfaction. Miles is a terrific new character with a voice all his own, and his teenage foibles are both recognizable and refreshing. He’s a hero worth rooting for, and his more personal family issues can be just as compelling as the end-of-the-world adventures. That’s the core of what makes Spider-Man still an invigorating character 50 years later, and Into the Spider-Verse taps into that essential element even with an alternate universe Spider hero. It’s got the DNA of Stan Lee and Steve Ditko’s original creation and given a welcomed jolt of relevancy thanks to the onscreen racial diversity and youthful perspective. Let me cite one prime example that showcases how great the storytelling can be (minor spoilers). At one point, Miles is bound and gagged by the other heroes to prevent him from joining them in a dangerous activity they do not believe he is ready for. They’re removing him from the team for his own good. Then, at this low point, his father comes to visit him and tries talking to him through the other side of his dormitory door. They’ve had some challenging moments between them and what Mr. Davis has to say is extra challenging. He’s trying to connect with a son he feels he’s losing touch with, and it’s a one-sided conversation where Miles is unable to respond to his father’s pleas, who eventually walks away knowing his son is there but not ready to talk. Right there, the screenwriters have gone from the fantastic to the personal, finding a way to bring Miles even lower but in an organic fashion that plays right into his ongoing communication problems. It’s a simple moment to start with, standard even, but then having it contribute the father/son estrangement is beautiful and handled so well. The sparkling screenplay for Into the Spider-Verse is packed with moments like this. The voice acting is perfectly suited for their roles. Moore (The Get Down) is an expressive and capable young actor that brings a terrific vulnerability to Miles, selling every emotion with authenticity. Johnson (Tag) is the absolute best choice for a slacker Spider-Man who has become jaded and self-indulgent. His laid-back rhythms gel nicely with Moore’s eager breathlessness. Henry (Widows) is so paternal it hurts your heart. Steinfeld (Bumblebee) is poised and enjoyably spry. Cage (Mandy) is doing everything you’d want a Nicolas Cage-voiced crime fighter to be. Schreiber (Ray Donovan) can be threatening in his sleep with that velvety voice of his. Plus, you get Katheryn Hahn as a villain, Zoe Kravitz as Mary Jane, and Lily Tomlin as Aunt May, and they’re all great. 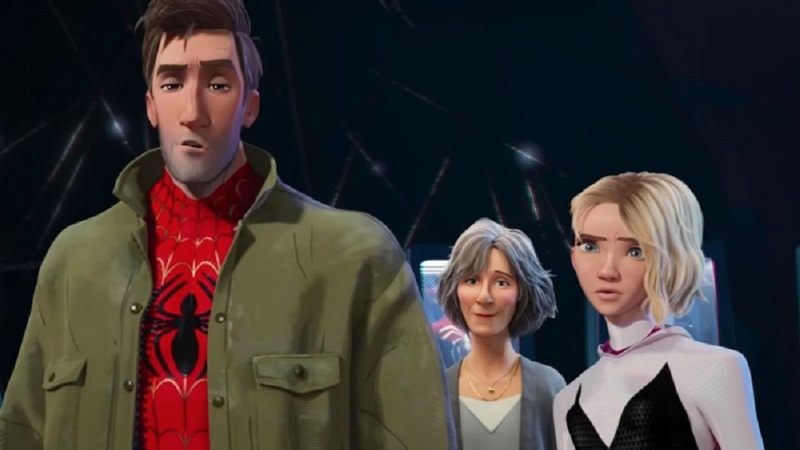 As the credits rolled for Spider-Man: Into the Spider-Verse, I tried searching my brain for any flaws, minor quibbles, anything that would hold the film back from an entertainment standpoint. The only thing I could think of is that animation style, but different people will either find that look appealing or irritating. This is a glorious and gloriously entertaining movie replete with humor, heart, surprises, payoffs, and a great creative energy that bursts from the big screen. This really is a movie to see on the big screen as well, to better feast on the eye-popping visuals and pop-art comic book aesthetics that leap from the page to the screen. It’s the second-best Spidey movie, after 2017’s impeccably structured solo venture, Homecoming. The late addition of the other alternate universe Spider heroes keeps things silly even as it raises the stakes. The film is a wonderful blending of tones and styles, from the different characters and universes to the heartfelt emotions and vicarious thrills of being young and super powered. This is a movie that even Spider novices can climb aboard and fall in love with. 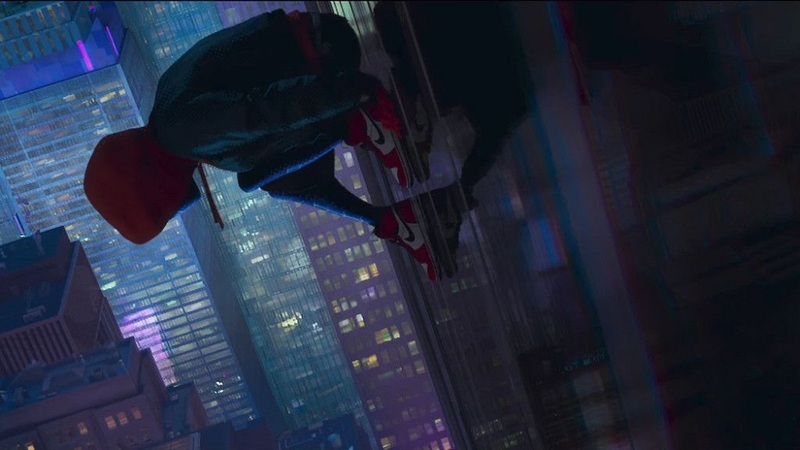 Into the Spider-Verse is a film for fans of all ages and nothing short of the best animated film of 2018. It’s as good as advertised, folks.